Frankly, I do not enjoy cooking, baking or anything in between. I find it tedious and frustrating and although I do what I have to do to get by, you will never find me trying to concoct a five star meal or a ten layer cake for the fun of it. I find baking particularly frustrating because everything has to be so precise. I’m more of a toss it in the pan and see what happens kind of girl. But, there is something so nice about presenting someone with something that is homemade. That being said, I love easy peasy recipes that seem more complicated and impressive than they actually are. When I decided to make a sweet treat for my friend’s carnival themed birthday party, I decided that birthday cake popcorn would be perfect. There are about a kazillion variations of this floating around, so I thought I would share how I did it, as the results were delicious. 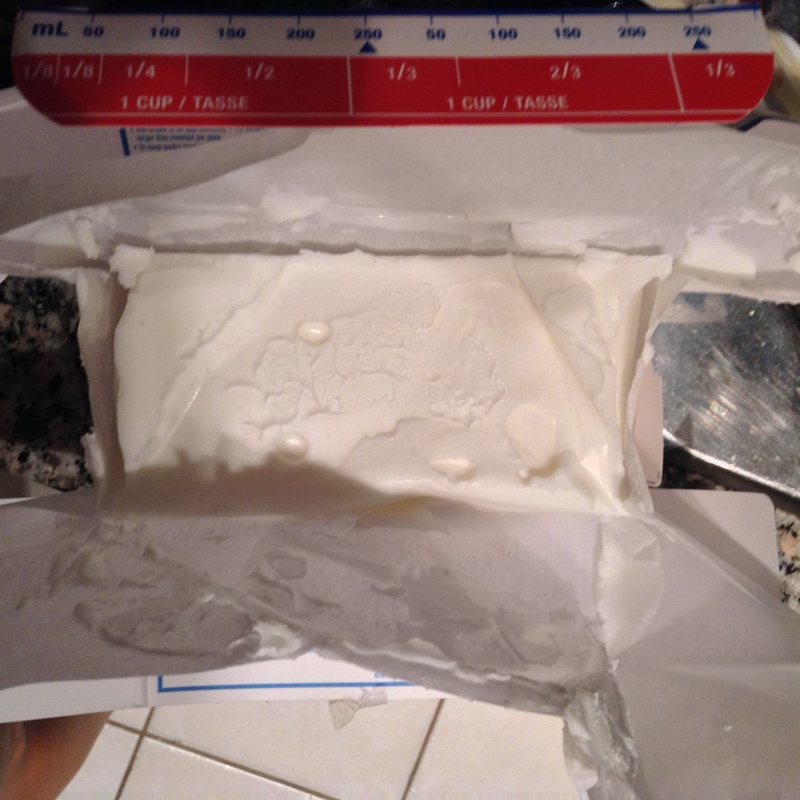 I was a bit nervous about this as I know chocolate can be a bit finicky to work with. My friend Seph will remember the great cake pop disaster of 2011. You’d think I would have retained a thing or two from the Chocolate Tales workshop I went to. But…not so much. 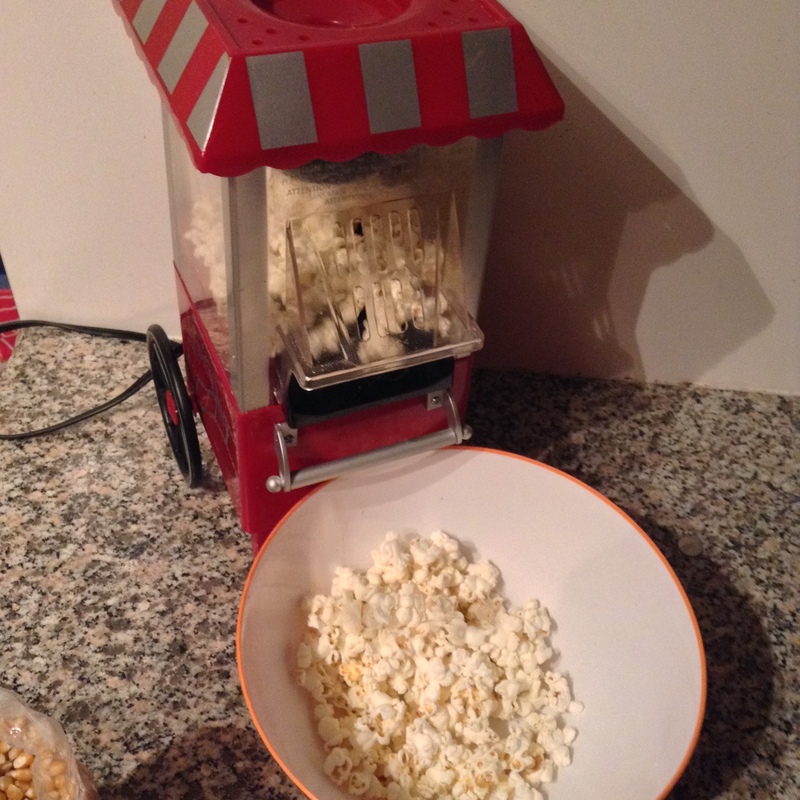 Meet my popcorn maker. He and I are best friends, as he is easily my most used kitchen contraption. I begin by air popping about 1/2 cup on popping corn. This will yield about 6 cups of popcorn. Because I really love sweet and salty treats, I lightly salted the popcorn with sea salt. 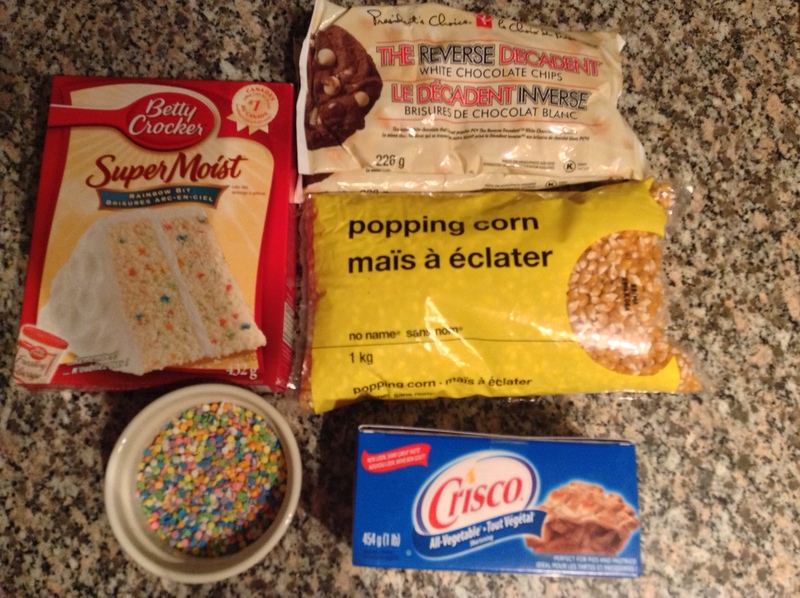 I recommend this step as I really think it helped to balance the super sweet ingredients. 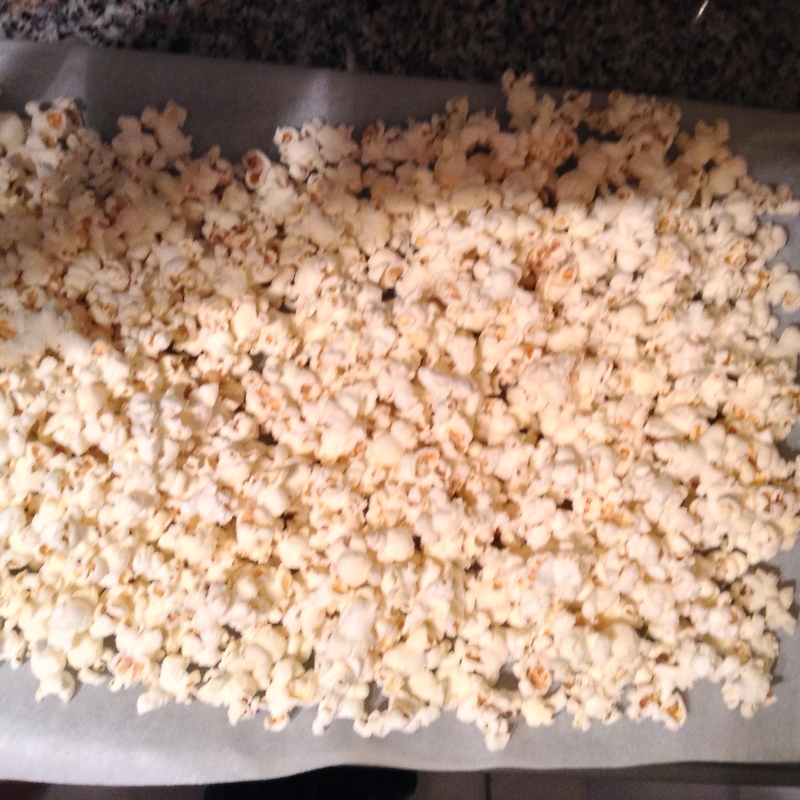 I then put the lightly salted popcorn on a wax paper lined cookie sheet. 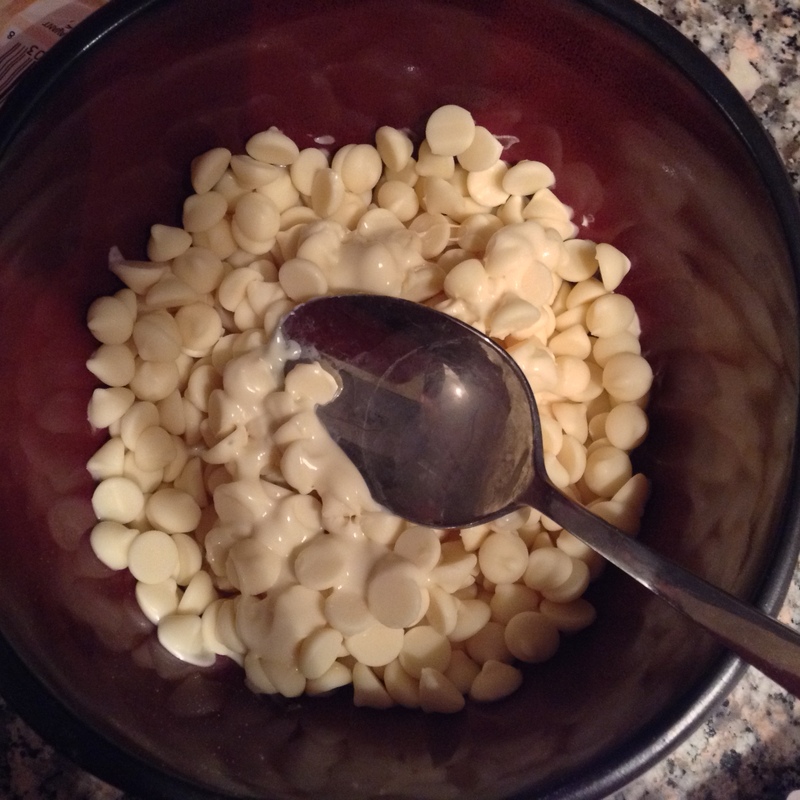 For the popcorn coating, the first step is to melt the white chocolate chips. I was going to create a double boiler using a metal bowl and pot over the stove but quickly decided that was too complex for my liking, and turned my attention to the microwave. I heated the chips in a bowl in 15 second increments, stirring in between until it was fully melted and smooth. I added 1/8 cup of vegetable shortening to the chocolate to thin it out. Shortening comes with handy dandy markings on the package to make this easy. Thanks, shortening. 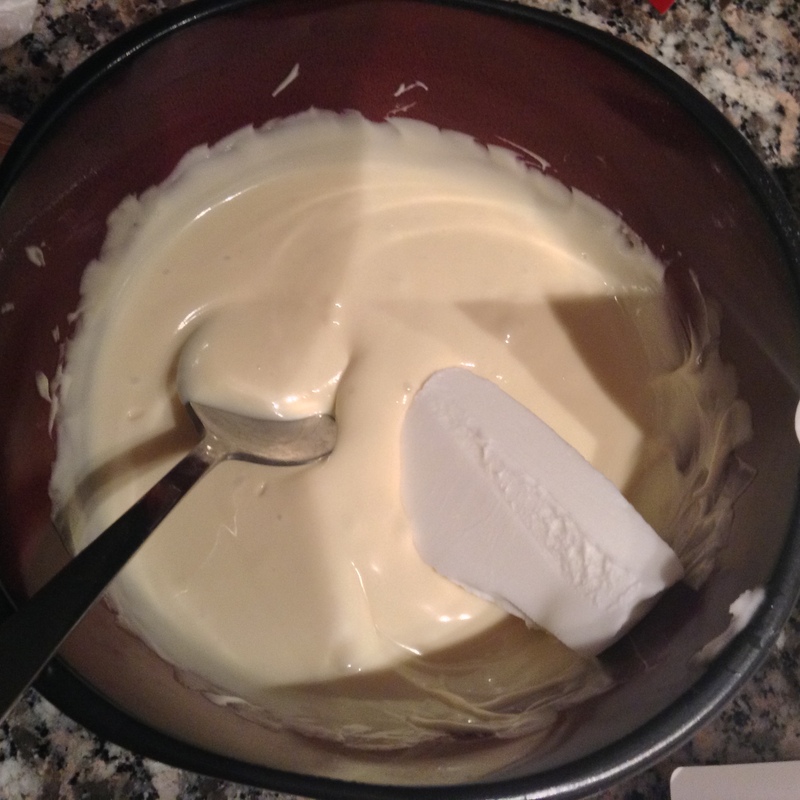 And lastly, I added 1 cup of confetti cake mix to the chocolate shortening mixture. 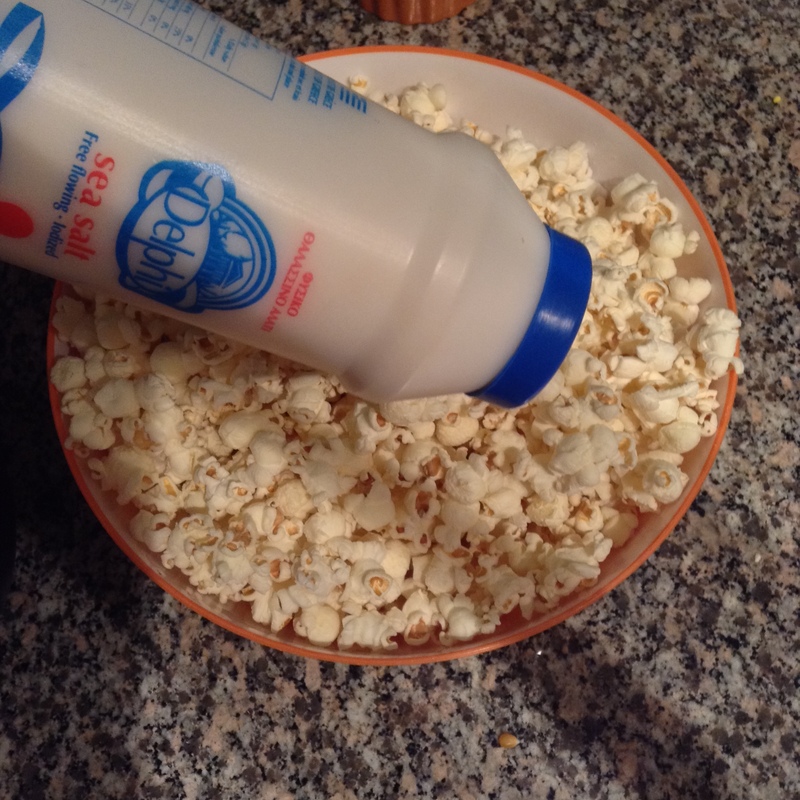 I poured the mixture over the popcorn and tossed it slowly with salad spoons, being careful not to break up the popcorn in the process… Apparently it is much easier to use your hands but, gross. 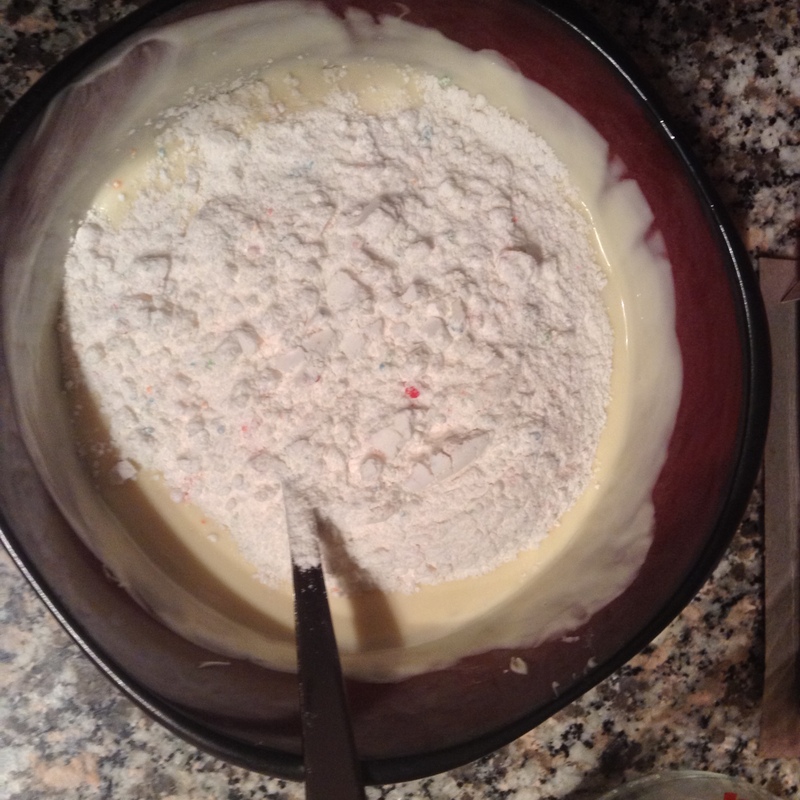 I then sprinkled confetti sprinkles (sprinkled confetti sprinkles? Wonderful command of the English language, Ash) all over the popcorn and put it in the fridge to set. 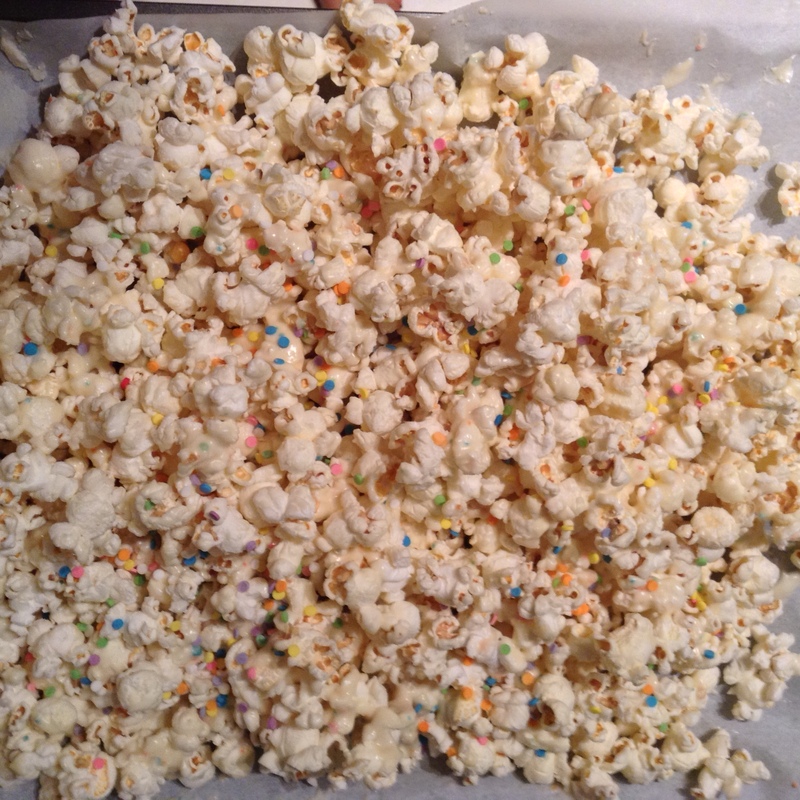 The birthday cake popcorn tastes best right out of the fridge, but it is really so delicious either way. This sweet treat was a hit, so I know I’ll be making it again soon. If you give this a try, I would love to know how it turned out. Or, share your favourite easy peasy treats below. This was so easy and yummy that it’t got me wanting to coat all of my favourite foods in this deliciousness. Birthday cake lobster, anyone? I was a lucky recipient of this deliciousness you created, and I can’t say enough about how amazing it is! LOL, and as your partner in crime for the great cake pop disaster of 2011, I fully support a recipe that is easy and looks like it is supposed to at the end (you know, those cake pops would have been perfectly acceptable as Halloween cake pops – we could have passed them off as Rudolph’s evil, deformed, twisted siblings – too bad Halloween comes before Christmas). I see you are now a pro at melting stuff (remember what happened to the first batch of candy melts that we put in the microwave?) and thank you so much for sharing your method. This was a delightful treat – it looked so cheerful and festive, and tasted even better. Looks yummy I must try this one out…unless someone is planning to make another batch?